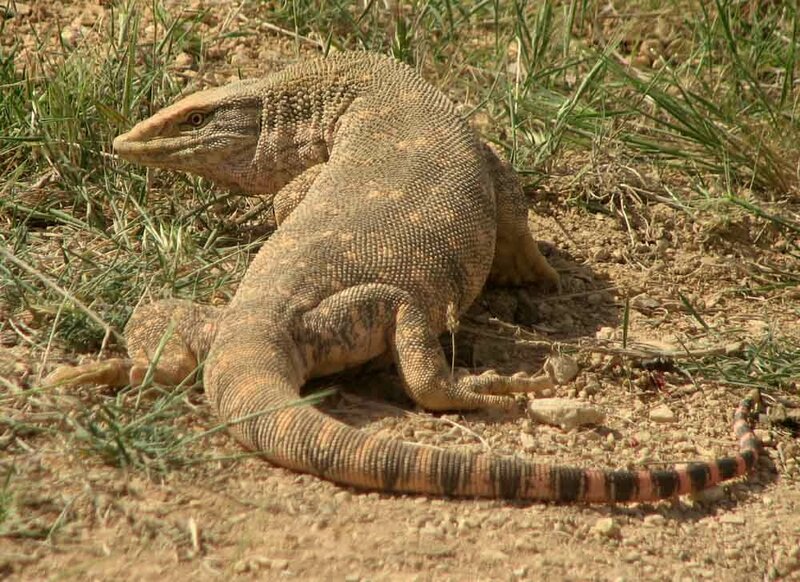 Desert Monitors in Birecik are conserved through community-based conservation. Urfa Steppes, one of the largest pristine steppe habitats in Europe located in the South eastern part of Turkey, covers two Key Biodiversity Areas (KBAs), namely Akçakale Steppes and Birecik Steppes. The area holds several steppic species such as Goitered Gazelle (Gazella subgutturosa), Striped Hyena (Hyaena hyaena), Long-eared Hedgehog (Hemiechinus auritus), Great Bustard (Otis tarda), Cream-colored Courser (Cursorius cursor), Pallid Scops Owl (Otus brucei), Bald Ibis (Geronticus eremita) and Desert Monitor (Varanus griseus). Main threats to biodiversity are expansion of arable land and irrigation projects, agricultural chemicals, pebble quarries, illegal hunting, overgrazing and the construction of dams. The Birecik Dam has in fact flooded an important portion of the Southern Euphrates Valley. – Community-based conservation for Striped Hyena, Cream-colored Courser and Monitor Lizard. To this end, a local conservation network is established among shepherds and farmers. – Reintroduction of Goitered Gazelle in the Kızılkuyu Wildlife Reserve and development of a managament plan for the site. – On the ground protection of the Bald Ibis, which resulted in an increase from 25 individuals in 2003 to 200 individuals in 2015. – Identification and monitoring of wintering grounds of the Great Bustard.